On the Rain-Slick Precipice of Darkness 3 will appeal to those who have nostalgic memories of 16-bit games, as well as those who enjoy Penny Arcade's style of writing. Created by Mike Krahulik and Jerry Holkins in 1998, Penny Arcade has become one of the most successful gaming-centric webcomics ever made. It still receives several updates each week, and the creators have also started a successful gaming expo and charity fund in the form of both PAX and Child’s Play, respectively. With that being said, it makes sense that their next step would see them taking the plunge into making an actual game. And yet the topic of this review is not their first attempt at it. In 2008, two downloadable games were released as part of an episodic series called Penny Arcade Advenures: On the Rain-Slick Precipice of Darkness, focusing on the comic’s protagonists, Tycho and Gabe, as well as a nameless third character whose appearance is customized by the player at the game’s start. These initial two games were developed by Hothead Games, but for various reasons, development on future episodes ceased after the second one was released. Krahulik and Holkins even put up the remainder of the series’ plot on their website, assuming that the remaining titles would never see the light of day. Now, thanks to developer Zeboyd Games, the series has returned with On the Rain-Slick Precipice of Darkness 3 – but not in the same way one would expect. 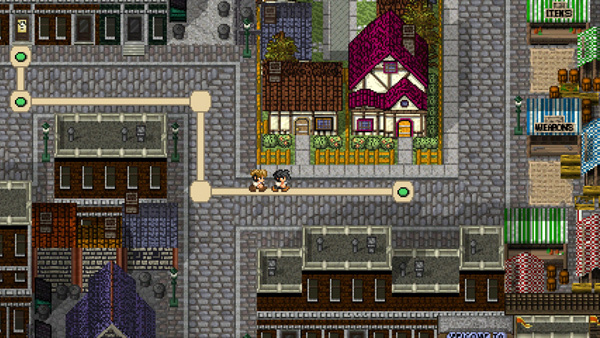 While the initial Hothead titles used modern polygonal graphics for its characters and environments, On the Rain-Slick Precipice of Darkness 3 goes for an intentionally old-school approach, with graphics and music reminiscent of classic Super Nintendo-era RPGs such as Final Fantasy VI and Chrono Trigger. This decision is likely due to the fact that Zeboyd‘s previous games, Breath of Death VII and Cthulhu Saves the World, were also retro throwbacks when it came to presentation. This game is no exception, and while it’s ultimately a title best enjoyed in short spurts, some excellent writing and clever gameplay ideas make it enjoyable overall. Despite being a role-playing game, a genre typically known for more involved plots, the story here is fairly light, with more of an emphasis being placed on clever dialogue between the cast. Zeboyd collaborated with the writer of the comic to transfer some of the humorous wordplay into this game, and it shows. The main events of the game can be summed up very simply: After their adventures in the first two games, paranormal investigators Tycho and Gabe set out to recover the Necrowombicon, an occult book wth mysterious powers, from the evil Dr. Blood. Everything from this point is more or less an excuse to put Tycho, Gabe, and their partners (consisting of Tycho’s sarcastic ex-wife and their companion Jim, who is nothing more than a skull in a tank) into various environments where they fight various monsters and exchange quips. Most of the game consists of battles, which play out in a traditional turn-based manner that is similar to older Final Fantasy games. Zeboyd has, however, made some tweaks to the formula to make things less frustrating for the player. No longer is there any need to worry about being low on hit points after each battle, as the characters’ hit points regenerate following every victory. With the exception of one area, battle encounters are never random, but are instead represented by static monster sprites on the environment that players must walk up to themselves. 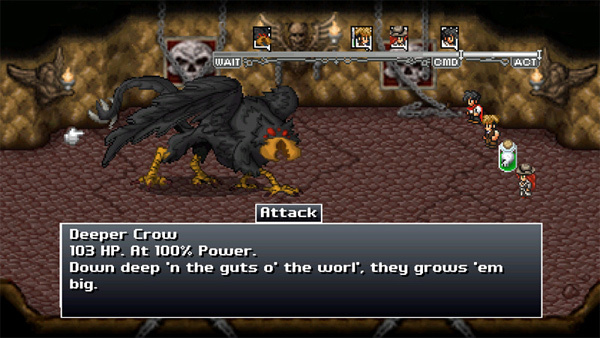 The game also contains a customizable class-based system for special attacks. While each of the four main characters have default classes assigned to them, as the game progresses, players unlock a list of additional classes that can also be assigned to whichever characters they want. The classes are given humorous names like the Crabomancer, the Slacker, and the Hobo, and each vary in the types of moves they can pull off. Instead of assigning experience points from battle to the characters so that gamers can boost their stats, all of the classes level up, with more points going to the ones used in battle. The characters themselves can be upgraded through buying equipment with money that is earned from battle. The magic system is also interesting, and allows for its own unique form of strategy. Each character starts the battle with no MP (magic points), but with each turn they gain one point. Players can choose to spend these points on special attacks and spells that have various attacks depending on each character and class, decide to spend 1 or 2 MP right away on weaker attacks, or choose to physically attack. An additional choice is presented by the inclusion of items, which can allow players to stock up their MP for stronger attacks. These systems make the game much more accessible to those unfamiliar with RPGs, along with an always-adjustable general difficulty setting. The general gameplay is definitely fundamentally solid, and as mentioned before, the interplay between characters is quite funny. The main thing that keeps the game from being truly great is the factor of monotony. Every new place you venture to plays out the exact same way: enter a map, walk around fighting enemies you find, get to the end, where there is likely a boss, leave, buy some upgrades, rinse, and repeat. While the game is pretty lengthy for something that only costs five dollars, it does feel padded out at times with nothing but fight after fight coming at you. Maybe if more gameplay mechanics were continually introduced as the player progressed, things would feel a bit more exciting. Unfortunately, that is not the case. It does help that the featured gameplay system works well, to the point that if you play for an extended period, grow weary, and stop playing for several hours, you will probably be really into it again when you start back up. It’s for this reason that the game is best played in short periods instead of marathon sessions, in order to prevent its charm from wearing off. As mentioned, in addition to the solid battle gameplay, another saving grace of the game is its writing. Although dialogue is restricted to voiceless text and pixelated character portraits, the cast still has lots of personality and chemistry, and there is plenty of quality writing to be found. 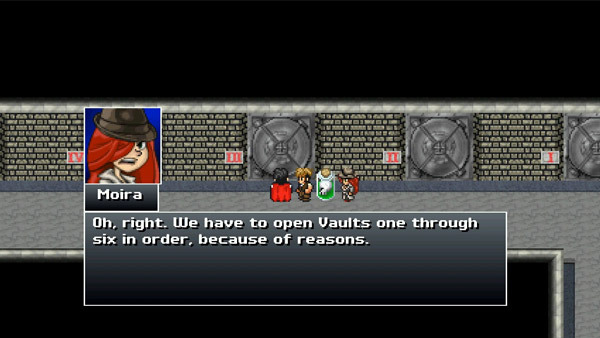 Additionally, some of the actual environments get creative and throw some surprises at you during the latter half of the game. Finally, the title’s retro visual and musical style is pulled off very well, with engaging tracks and some nicely detailed enemy sprites. On the Rain-Slick Precipice of Darkness 3 will definitely appeal to those who have nostalgic memories of 16-bit games, as well as those who enjoy Penny Arcade‘s style of writing. The overall experience may grow long in the tooth for those who play it in marathon sessions, but when played in smaller chunks, the game’s battle system entertains, and the personality it gives off is undeniable. If there is another entry in the series (the original plan was to make four of them,) hopefully the gameplay will be given more variety. Still, it cannot be denied that what is here is quite solid.